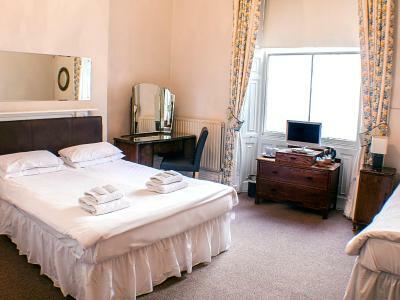 Lock in a great price for The Queensbury Hotel – rated 8 by recent guests! The personnel was amazing and went the extra mile to give good service. Checking in was late at night, and went smoothly, also they kept 3 packages that a shipped to the hotel. We had to check out early to get the train, so the staff woke up early to prepare us the included breakfast at 7am which usually starts at 8:30am. Location was great! 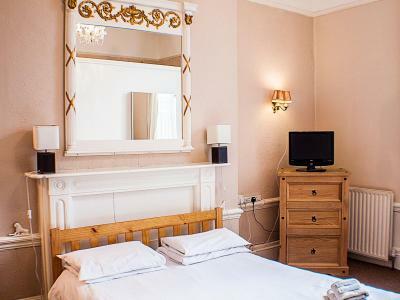 This hotel is in a prime location in Brighton and everything you need a short walk away. 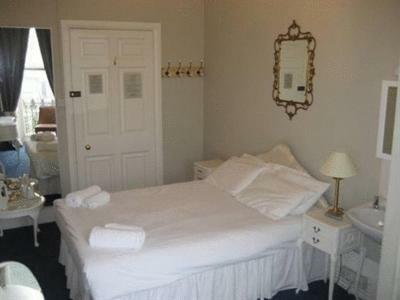 The staff and facilities were good value and the room kept well. 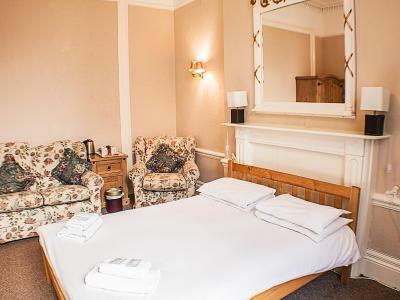 The Queensbury Hotel This rating is a reflection of how the property compares to the industry standard when it comes to price, facilities and services available. It's based on a self-evaluation by the property. Use this rating to help choose your stay! One of our best sellers in Brighton & Hove! 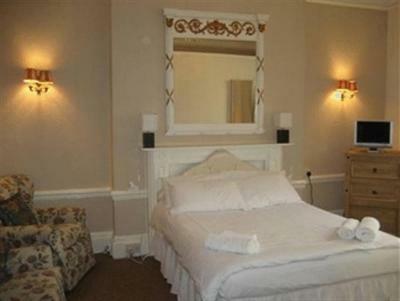 This fully refurbished Grade II Listed hotel is opposite Brighton’s West Pier. 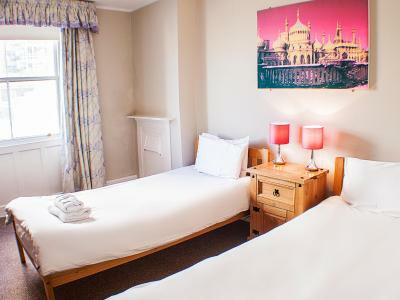 It offers free WiFi and seafront accommodations, 15 minutes’ walk from Brighton Rail Station. Some of the rooms have traditional high ceilings, and retain 19th-century features. Some have private bathroom facilities, and shared bathrooms are also available. 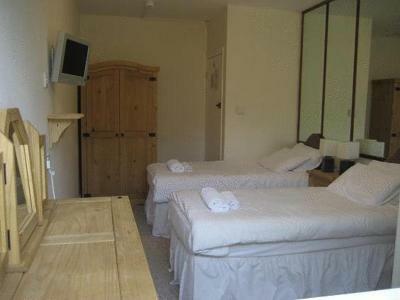 Each also has a flat-screen TV and tea/coffee making facilities. 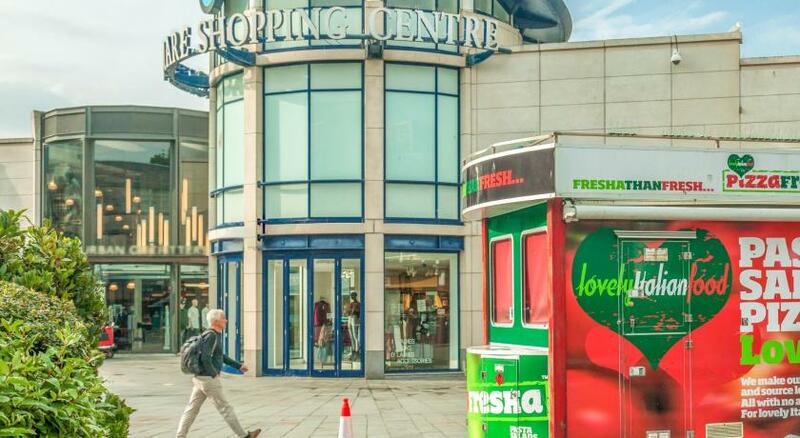 Brighton’s shops, restaurants and seafront attractions are within walking distance. Guests can enjoy a full English breakfast at a nearby restaurant, for a surcharge. 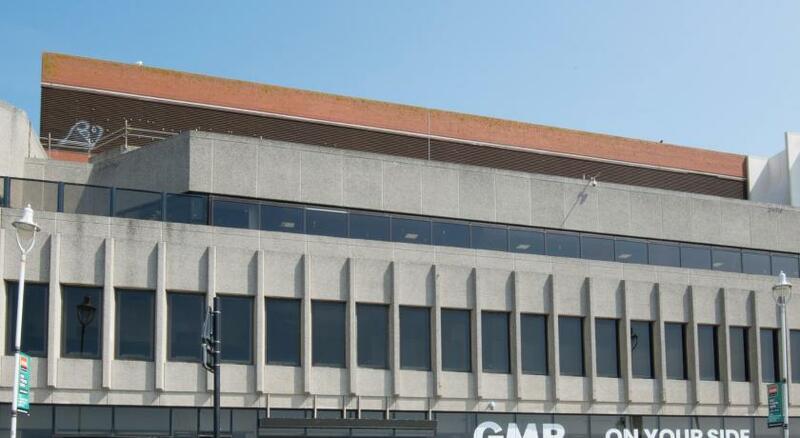 A public underground car park is available at an additional cost and limited local private parking can be arranged upon request and subject to a surcharge. Guests should note that the hotel does not accept stag or hen parties. 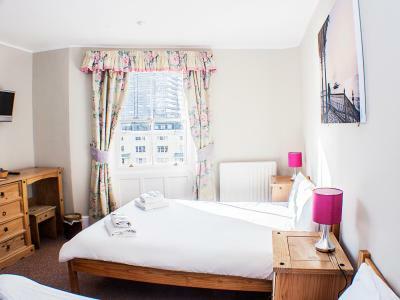 When would you like to stay at The Queensbury Hotel? Spacious room with private bathroom. 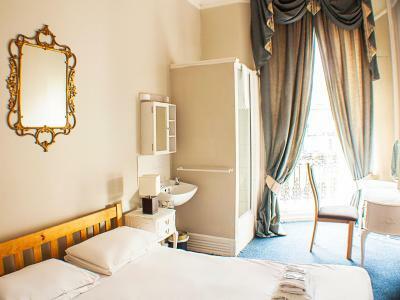 This spacious room with attached bathroom is located on the lower ground floor. 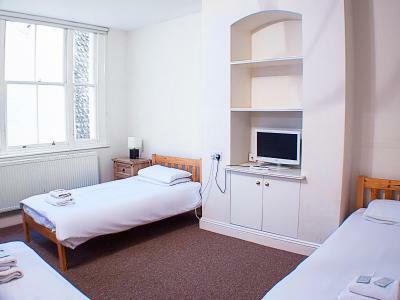 It includes free WiFi, Freeview LCD TV, free toiletries and tea and coffee-making facilities. 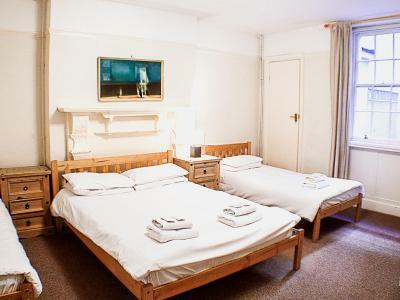 This twin room is located on the lower ground floor. Please note that the shared toilet is outside the bedroom and is set along a short hall and is shared with one other room. 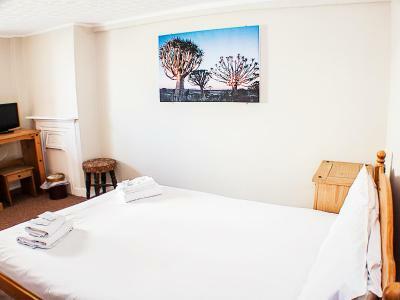 The room has an en suite shower, wash-basin, free WiFi, Freeview LCD TV, complimentary toiletries, and tea and coffee making facilities. This room is at the front of the hotel overlooking the gardens with a partial sea view. It will be located either on the third or fourth floor (please note there is no elevator at the property). 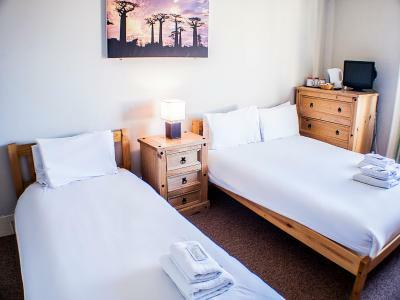 A private bathroom with shower and free toiletries, tea/coffee making facilities and a flat-screen TV are featured in this room. 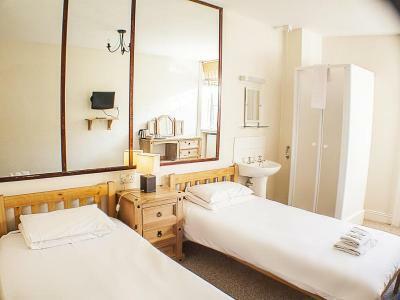 An private bathroom with shower and free toiletries, tea/coffee making facilities and a flat-screen TV feature in this room. 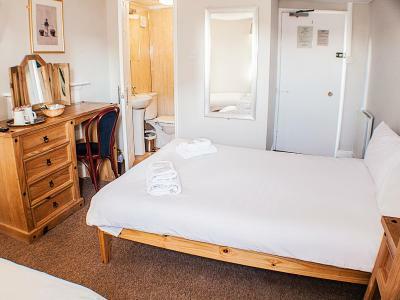 A private bathroom with shower and free toiletries, tea/coffee making facilities and a flat-screen TV are featured in this room on the third floor. 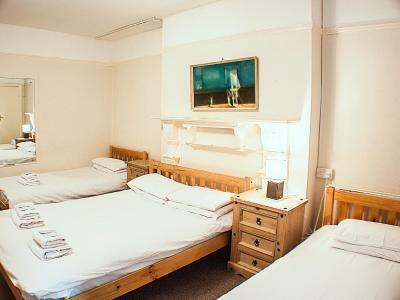 This small single room is located off the second half-landing and has access to a shared bathroom, down two flights of stairs. 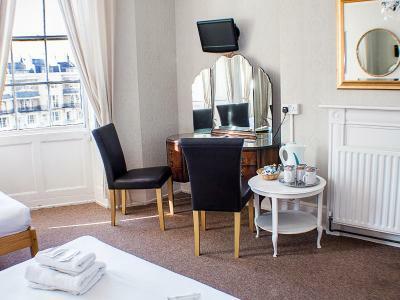 With free Wi-Fi, it includes a Freeview LCD TV, complimentary toiletries, and tea and coffee making facilities. 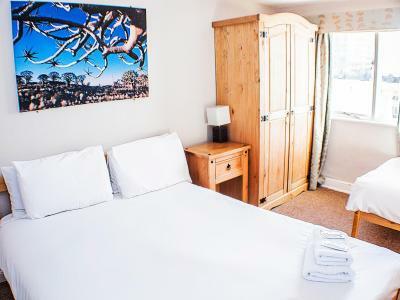 A spacious room located on the lower ground floor with 3 beds, free WiFi, Freeview LCD TV, complimentary toiletries, and tea and coffee making facilities. House Rules The Queensbury Hotel takes special requests – add in the next step! Debit card The Queensbury Hotel accepts these cards and reserves the right to temporarily hold an amount prior to arrival. The Queensbury Hotel accepts these cards and reserves the right to temporarily hold an amount prior to arrival. Please note that The Queensbury Hotel has no elevator and most standard bedrooms are located on the 3rd and 4th floors. Please note that the property does not permit hen, stag, or party bookings. Group bookings of more than 6 guests are allowed only with prior request. Separate bookings which are found to be part of the same group will be refused entry. An optional full English breakfast is available at a restaurant 2-minutes walk away, with a hotel voucher for GBP 5 per person. Not much I didn't like, room a bit tight but still accommodating! The view to the square was lovely but ruined a bit by a homeless tent right outside. 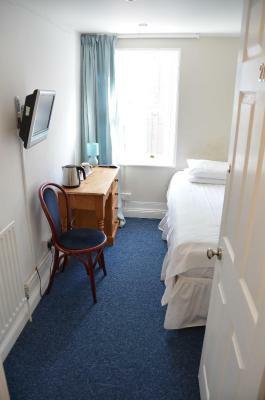 Perfect location, clean room and ensuite, friendly staff! Included breakfast was great! Lots of stairs, but good exercise if your room is on the top floor. Good choice of continental breakfast, just a shame they don't offer a cooked option. 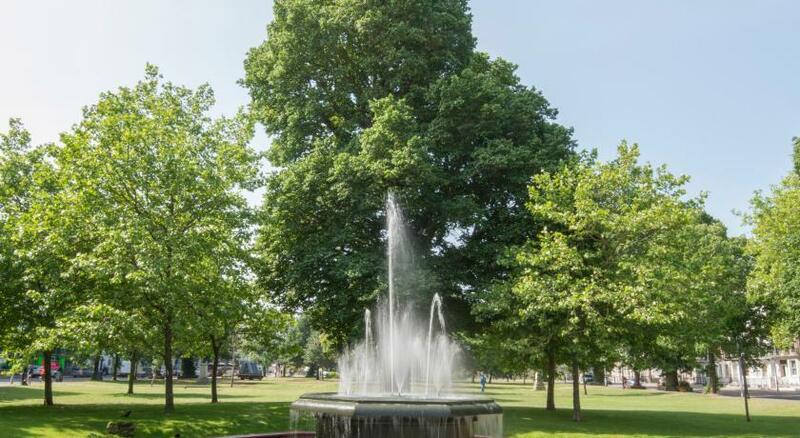 Location is great - right next to the i360 and a short work to the city center. The hotel has no elevator and they put us on the 5th floor. Imagine bringing our very heavy luggage upstairs. No one assisted us or offered. Our small pet was not allowed. Room very small, we could barely move around. The bathroom fixtures were very old and outdated. Will not go back or will not recommend this Hotel to anyone. Cramped and filthy room. Loud pump on the bathroom every time you ran the water and flushed the toilet. Our room was very comfy we even had a little fridge in there. 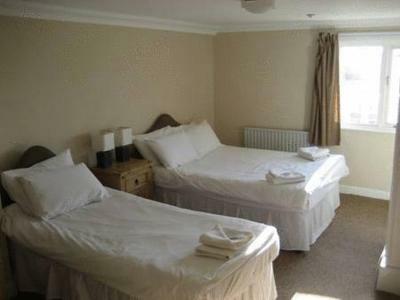 The beds were comfy and clean, our room was warm with lots of tea, coffee, milk even small packets of biscuits there for us. There were sachets of shower gel and shampoo too and the Continental breakfast was very well supplied. Toilet masterator was extremely loud. Great location with reasonable long stay parking close-by. Modern and clean accomodation. 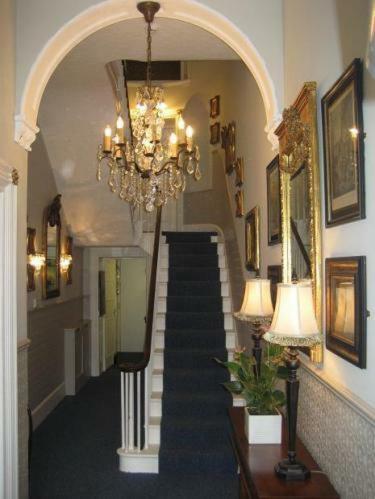 The hotel is a Grade 2 listed building which has been very sympathetically designed and decorated. We stayed for two nights in a triple room with its own private shower room. 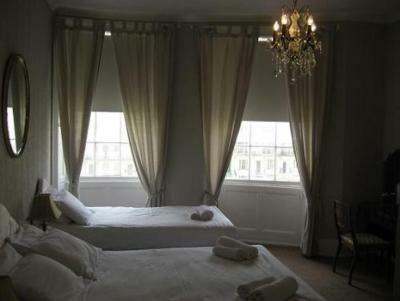 The room was on the first floor and had a view of the sea from the large windows. 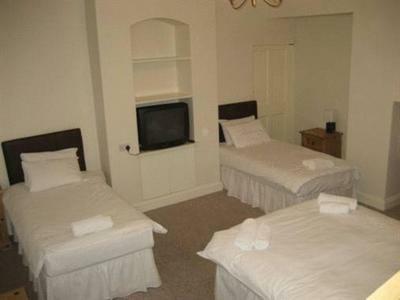 The room had tea and coffee making facilities and a small supply of biscuits which was replenished on the second day. The buffet style breakfast was very good with toast, croissants, cereals, fruit, ham, cheese, orange juice, tea and coffee. 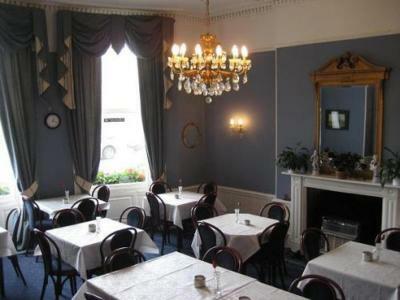 We were recommended a nearby restaurant (The Regency, which was on the opposite corner from the hotel) for our evening meal, which we visited on our first evening and enjoyed very nice, reasonably priced, fish and chips and a gorgeous pudding! The beach (and the new i360 which is well worth a visit) is just over the road from Regency Square where The Queensbury is located. 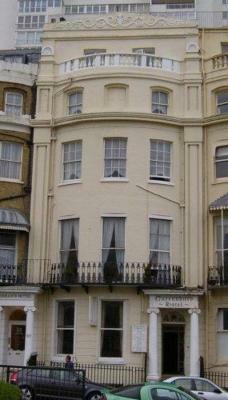 It is also just a short walk to all the sights of Brighton, including The Lanes and Brighton Pier. We would definitely visit Brighton and The Queensbury again. Friendliness of the staff who were extremely helpful. 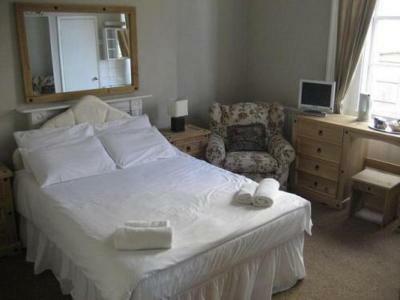 The furnishings, bed linen and towels are of a very high standard and the place is immaculate. The location is central and convenient . great price for a decent room.